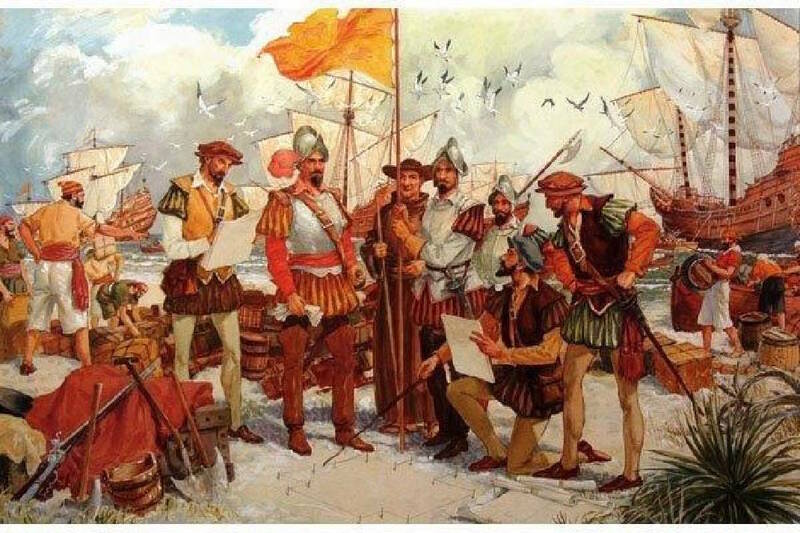 Spanish conquistador Tristan De Luna landing at Pensacola in 1559. Thirty years ago, there was a sign the Honors Golf Course entrance on Lee Highway stating the site was on the route of the 1539-1543 Hernando de Soto expedition. That sign is now gone, and recent scholarship says that de Soto did not go through Chattanooga. However, he did come close. De Soto traveled 4,000 miles, starting in Florida, moving north into North Carolina, then turning into east Tennessee and Georgia. From Georgia, he went west into Alabama and ultimately across the Mississippi River. By the time he left North Carolina, de Soto had moved south, a little east of the Tennessee River. Had he followed exactly alongside the river, he would have passed through Chattanooga. It has always seemed that would have been a more logical route. Alas, scholars say no. You might ask, "Why didn't de Soto travel close by the Tennessee River?" The answer is food. He had to feed 600 men and 250 horses. So, the route they followed was dictated by where they could renew their food supply, and this meant they had to connect to populated sites where there was food. Thus, they moved from one Indian village to another, not always following the easiest or most direct route. What prompted de Soto to embark on this expedition? To summarize, it was glory, gold and God — probably in that order. Gold, as always, was a factor, but de Soto was already a rich man. He made a fortune in Central America and later with Pizarro in the Inca conquest. So I think glory came first. I doubt de Soto felt he had achieved that when he died near the Mississippi River. Some say he died of a broken heart. The lack of food played a major role in the next Conquistador expedition, that of Tristan de Luna in 1559-1561. During the de Luna expedition, a detachment of Spaniards did indeed enter Chattanooga. De Luna sailed from Mexico intending to establish a Spanish colony and hamper any French attempt at colonization. After establishing a base in Pensacola, Fla., de Luna was to move overland and establish a colony on the Santa Elena island (Parris Island) off the coast of South Carolina. After landing in Pensacola, a hurricane destroyed all but three of his ships. Short of food, de Luna tried to form a second settlement inland along the Alabama River. Soon both colonies were hungry. De Luna recalled that de Soto had encountered a well-fed Coosa Indian nation in southeast Tennessee and north Georgia. He sent 200 men north to seek food from the Coosa. To receive food, the Spaniards had to assist Coosa warriors in putting down a rebellious tribe living in the Chattanooga area. Thus, for a short time, conquistadors were in Chattanooga, as it later became known. Despite de Luna's efforts, food shortages persisted, and the settlement was abandoned in 1561. De Luna never reached Santa Elena, but the Spaniards hadn't given up. This would lead to the last conquistador to come near Chattanooga. That was Juan Pardo in 1566-1568. Actually, he didn't come all that close. He got no closer than the Little Tennessee River. However, he started on a more ambitious project. Pardo had two goals. First, he wanted to develop bases in the Carolinas that could supply food for the proposed colony at Santa Elena. His second task was to establish an overland route connecting Santa Elena to Zacatecas, Mexico, where Spanish silver mines were located. This latter objective seems today like a ludicrously over-ambitious and difficult plan. Nonetheless, one has to marvel at the mind-boggling distances the Spanish conquistors were able to cover. Just consider the thousands of miles traveled by de Soto in the Southeast and Coronado in the West. Along the route to Mexico, Pardo was to claim those lands for Spain. This he did. However, imagine the Indians' surprise when told they were now subjects of Spain. They didn't take it well. By the time Pardo reached the Little Tennessee River, the Indians in this region were gathering war parties. Upon being warned of this development, Pardo returned to Santa Elena. No other 16th-century Spanish explorer would venture into the Chattanooga region. Dr. R. Smith Murray, a retired urologist, is a past president of the Chattanooga Area Historical Association. For more information, visit www.chattahistoricalassoc.org.